The choice of alloy or steel wheels with winter tyres is one that's entirely down to individual taste. Quality is key: the wheels should look good for a few years and the tyres should maintain their safety credentials. Each new tyre profile promises better performance or higher levels of safety in rain than the one before it, and mytyres tries out these claims in our tyre tests. Read the results here on the site! 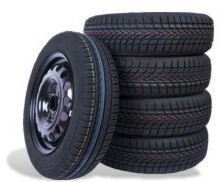 We know that safety AND style are on motorists' minds when shopping for steel wheels with winter tyres. Enter the make and model of your car in our intelligent wheel configurator to view you an assortment of wheels that are technically approved for use with your vehicle. Then, we'll "virtually" mount your choice on a vehicle image from our online database so you can check that everything fits together!